The journey to Burma began with a relatively surreal and unpleasant journey from Lombok to Bali, involving a VERY bumpy sea crossing (Nelson’s Travella travel sickness tablets are either amazing, or I have a stomach of steel), a sweaty and rammed bus journey during which my neighbour (from Lombok) proceeded to take selfies of himself with me much to the amusement of fellow passengers, being dropped somewhere that wasn’t the airport to which I thought I was being taken…. But I made it there eventually so all’s well that ends well. I flew to Yangon (formerly Rangoon) via KL and arrived early Monday morning. 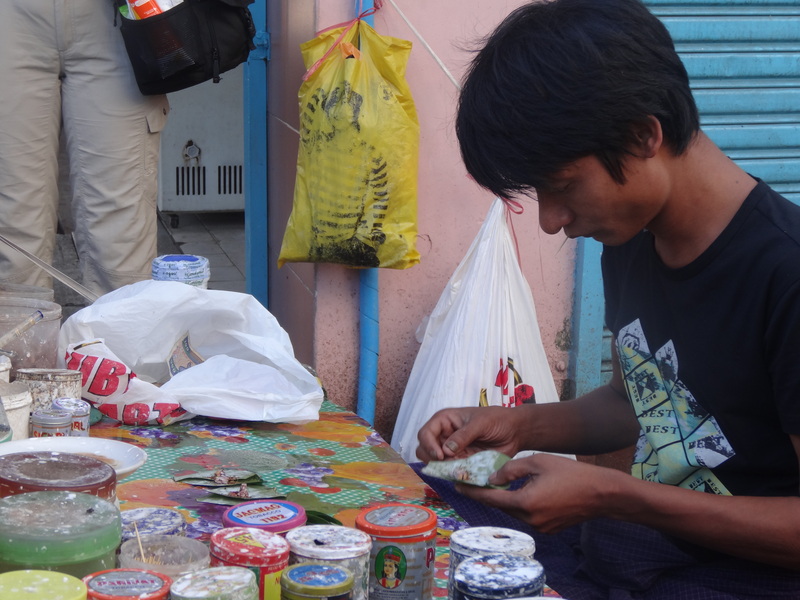 Two days later and I am still feeling very overwhelmed by the contrasts I am experiencing – both between the welcoming friendliness of the places I visited in Indonesia and the relative cautionary reception I have received here, and the gap between rich and poor in the country itself. Without doubt that is a reflection on where Burma is in terms of development itself. A brief history: it was a British colony until independence in 1948, and was then subject to a military dictatorship for almost 50 years which ended in 2011. Officially renamed Myanmar several years ago, many western countries still refuse to recognise this name (as it was imposed by the dictatorship) and still call it Burma. There was a big uprising in 1988 when huge numbers of pro-democracy demonstrators were killed (anyone who has seen Beyond Rangoon, which I watched at the time it was released in 1995 and then watched again on the flight over – this is a fictional film but based on real events around the uprising). Mainstream tourism only really began a couple of years ago, since when hotel prices have tripled. There is still a questionable human rights record and just before I arrived here I read about a Burmese journalist who died in prison whilst allegedly trying to escape by stealing a gun from one of the guards. It is a fairly chaotic place, with traffic jams as far as the eye can see, no way of crossing the road other than to step out and hope (I have adopted the practice of standing down-traffic from a local and following them!). People chew on betal, a kind of tobacco leaf, and then spit out the contents in the street, which is littered with red splats as a consequence. When I first arrived I thought my taxi driver was simply being polite by opening the door to spit, when he did it a second time I thought he was sneezing and said “bless you”. I now realise the spitting is commonplace and the people spewing red from their mouths are not coughing up blood, as I originally thought! The city is hot, very smelly in parts, with obvious poverty: on many street corners people sit with alms bowls. Our guide warned us not to give to any monks asking for alms as the people doing this are not in fact monks. I have just returned from sitting in a café having some lunch, being watched by a number of women holding babies, and every time they caught my eye they would signal for food. It was really hard. 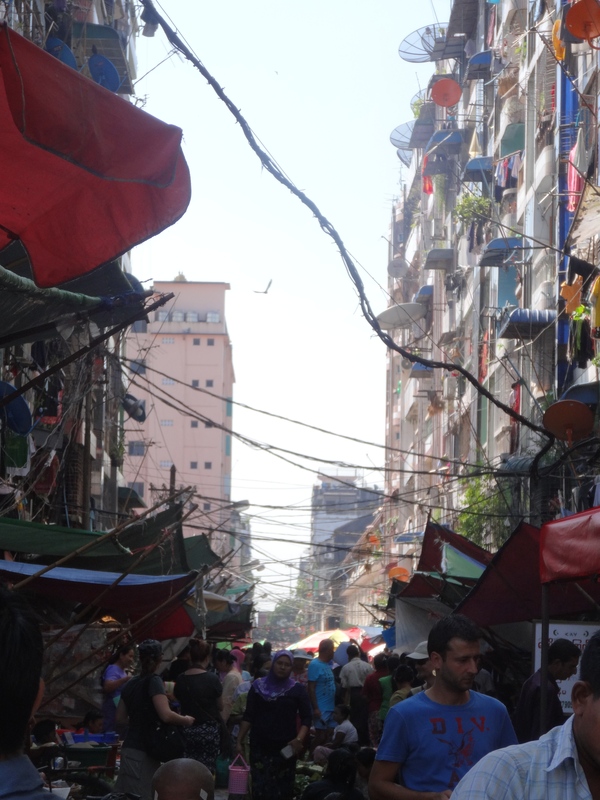 The architecture comprises some amazing (but fairly shabby) old colonial style buildings, together with run down blocks of flats with wires draped dangerously across the street from block to block. The first afternoon I was here, I wandered around a part of the city where the embassies are generally based and that gave a small insight into what it may have been like during colonial times – beautiful large houses in spacious grounds now well past their prime but still retaining a faded charm. In trying to gain some insight into life here, I am half way through a fascinating book called “Burma’s Spring: Real lives in turbulent times”, written by a British journalist who lived in Burma during recent changes. Each chapter tells a story about life from the perspective of a different person during the dictatorship. I am not sure if it these tales that are fuelling my current unease, or just the culture shock of being in a city that is in the early stages of democracy and tourism. It simply doesn’t compare to anything I have experienced previously. I don’t mean any of this to sound too negative, I am just still getting my head around it. 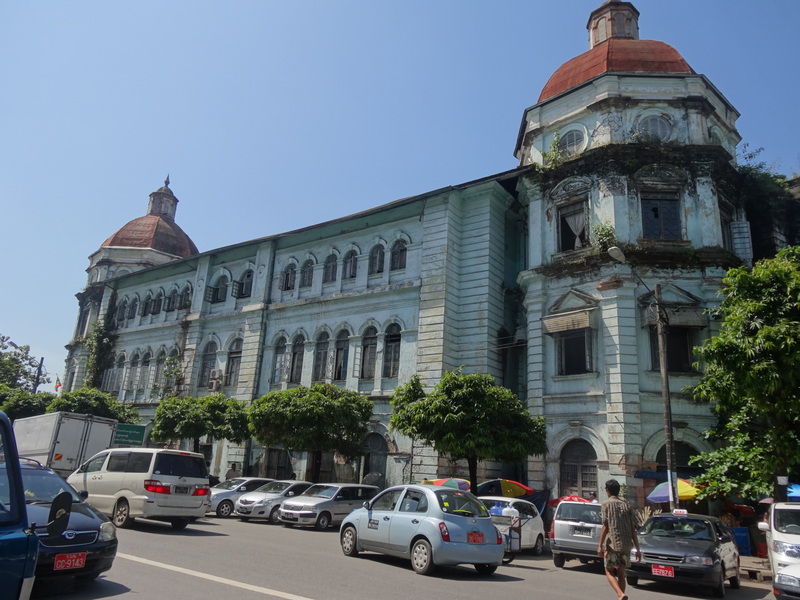 I am sure there are better parts of Yangon and have only ever heard good things about the country itself. I am very much looking forward to heading out of the city tomorrow to Bagan, the city of temples. I have a sunrise hot air balloon ride over Bagan booked on Friday that hopefully will prove to be as amazing as the photos I have seen, provided the weather permits us to fly. Finally, I have another confession. In view of the culture shock, I did seek refuge in an ex-pat hotel yesterday. I had a club sandwich and a cup of tea in air conditioned luxury and it was lovely. Then it started to rain so I had to have a salted caramel dessert whilst I waited for the rain to pass… I acknowledge that a club sandwich contains both chicken and bacon which is slightly at odds with my conversion to vegetanariasm, but as one friend said to me “everyone has to have a ‘give up’ day” once in a while, and this was my give up day. I can promise you that after a visit to another local market today, not dissimilar to the one I visited in Lombok only here the trucks actually drive over the produce laid out on the ground (presumably the skill is ensuring the tyres avoid the food? ), that the meat eating was only a temporary blip!